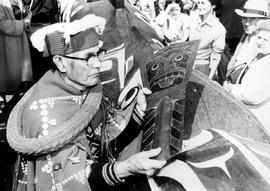 "Chief Mungo Martin holds copper crest which was to be presented with the royal totem pole to Queen Elizabeth II". "Crossing the Line in HMS Clio"; a ceremony held by seamen in honour of crossing the international date line. "Earl Grey, Mayor Douglas and party aboard the first car crossing the new Granville Street Bridge over False Creek, Vancouver, BC." "Installation of Bishop Christie"; Alexander Christie as Roman Catholic Bishop of Vancouver Island, 1898-1899. "Laying the corner stone, Congregation Schara Tzedeck, 1920; presented by Felstein Brothers." "Official opening of bridge"; construction of the Fraser River Bridge in New Westminster. "Opening ceremony, convalescent home, Duncan, BC." 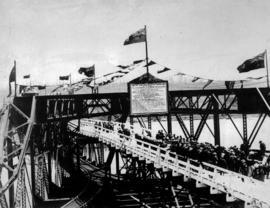 "Opening of the Granville Street Bridge, Labour Day, 1907." "Planting first post of Canadian Highway at Alberni". "Scene at opening of Granville Street Bridge, Vancouver, BC, Labour Day, 1909." "Unveiling of the King Edward VII Memorial Fountain, Vancouver, BC"; in front of the Vancouver Courthouse. 150th anniversary of the death of Captain George Vancouver; commemoration ceremony at the graveside, Petersham churchyard; a welcome from the borough of Richmond. 25 year award presentation by the Honourable E. T. Kenney. 50th Anniversary of the consecreation of St. Paul's church; Esquimalt; 30 Aug 1866. A pioneer reunion at the Kilarney home of Mrs. Z. K. Hall; planting a tree in honour of the occasion; Vancouver. A presentation being made to Victoria fire chief Alexander Munroe. Alaska Highway and Canol Pipeline construction. Ceremony in front of CANOL Refinery Whitehorse. Union Jack and US flag. RCMP and military. Alex M. Jardine, as aide-de-campe to the Governor-General, in the Senate during the Speech to the Throne ceremony, 1955; note the television camera at the right. American troups saluting flag at the opening of the bridge at Northport, Washington. Apprentice chefs recieving certificates from the manager of the Empress Hotel. At the opening ceremonies of the Queen Elizabeth totem pole; W.E. Ireland, Commander Dixon, Mr. Martin, and Lieutenant Governor Ross; Victoria. B.A. McKelvie and Letitia Schoefield at the unveiling of the cairn at Fort Shepherd.